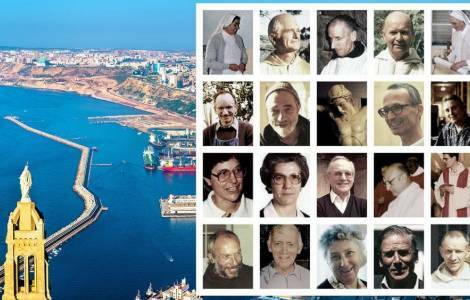 Oran (Agenzia Fides) – “Commemorating the death in Algeria of these nineteen Christian victims, the Catholics of Algeria and of the world wish to celebrate these martyrs faithful to God’s project for Peace that inspires all hearts. At the same time they wish to include in their prayers all the sons and daughters of Algeria who have like them, been victims of the same violence for living with fidelity and respect for others, their duty as believers and citizens in this blessed land”. This is part of the message sent by the Holy Father Francis on the occasion of the Beatification of the martyrs Bishop of Oran Pierre Claverie and 18 companions (religious men and women), killed between 1994-1996 in Algeria. The Message was read out at the beginning of the beatification Mass presided by the Prefect of the Congregation for the Causes of Saints, Cardinal Giovanni Angelo Becciu, Special Papal Envoy on 8 December in the Basilica di Notre Dame of the Holy Cross, in Oran. The Pope expresses his participation and joy and gratitude to the Church in Algeria for these lives of total donation, expressing the wish that these celebrations may help “heal the wounds of the past and create a new dynamic of encounter and coexistence in the footsteps of our Blessed martyrs ”. Thanking the President and the authorities of Algeria for facilitating the beatification on Algerian soil of these “martyrs of the greatest love”, the Pope expresses his affection for the Algerian people, “who suffered greatly during the crisis of society in the latter years of the last century”. Pope Francis quotes the “great message of love” bequeathed by one of the world’s best known spiritual teachers of this land Saint Augustine of Hippo: “By beatifying our nineteen brothers and sisters, Pope Francis said, the Church wishes to bear witness to her desire to continue to work for dialogue, harmony and friendship”. We believe, he concluded, that this event unprecedented in this country “will draw in the Algerian sky a great sign of brotherhood addressed to the whole world”.”. In his homily Cardinal Angelo Becciu said: “The tragic death of Blessed Pierre Claverie and his 18 companion martyrs, was a seed sown at a difficult time fecundated by suffering that brings fruits of reconciliation and justice. This is our mission as Christians: to sow every day the seed of the peace of the Gospel in order to rejoice for the fruits of justice . With this Beatification we wish to say to the whole of Algeria : the Church desires solely to serve the Algerian people and share our love for all people”. Reflecting on the second reading of the Mass taken from the Apocalypse, which speaks of an “immense multitude ” of those who have already reached eternal salvation after passing through the crucible of suffering , the Cardinal recalled that it is “these multitudes who have reached the destiny of glory, that the Church desires today to call by name the 19 newly Blessed killed between 1994 and 1996 in different places and dates but in the same turbulent context. In this land, here in Algeria, they announced the Lord’s unconditioned love for the poor and the marginalised bearing witness to loyalty to Christ and to the Church even to martyrdom ”. Coming from eight different Institutes they had different missions here in this land where they “were tireless and persevering in their service to the Gospel and to the local people despite the threatening climate of violence and oppression around them” said the Cardinal, highlighting that “all of them, aware of the danger decided to remain courageously at their posts until the end; they had developed a strong spirituality of martyrdom rooted in the prospect of sacrificing themselves and offering their lives for a reconciled society at peace”. AFRICA/NIGER - Six months of silence for father Maccalli, missionary kidnapped: "The only free person among us"